Titan's revolution is coming. All it needs is one final spark. After decades hunting wanted offworlders throughout the solar system, Corporate Bounty Hunter Malcolm Graves doesn't bother asking questions. So long as the pay is right, he's the man for the job. And he always works alone. 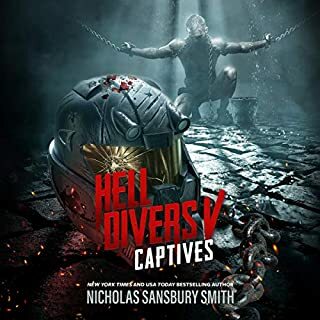 But when a high-profile bombing on Earth has Pervenio Corp clamoring for answers, they force him to team up with a strange, cyber-augmented partner. A young man more interested in statistics than instinct. Their assignment: Track down a suspected group of extremists from Titan who will go to any length to free their moon from the grip of Earth's corporations. 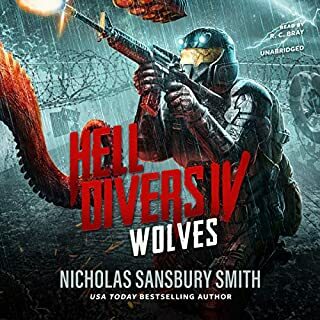 Heading into hostile territory, Malcolm will have to use everything he's learned to stay alive. But he soon realizes the situation on the ground is much more complex than he anticipated...and much more personal. 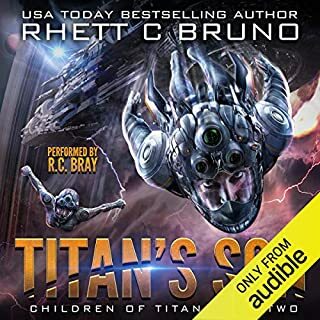 Experience the epic first entry in the Children of Titan series. 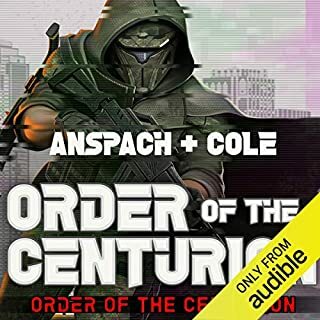 If you're a fan of The Expanse, Blade Runner, or Star Wars, you'll love this gritty, space opera thriller from USA Today best-seller Rhett C. Bruno! Initially I purchased this book because I saw the narrarator and as always RC did an amazing job with this one! The book followed a "collector" (basically a bounty hunter) trying to solve a terror plot. 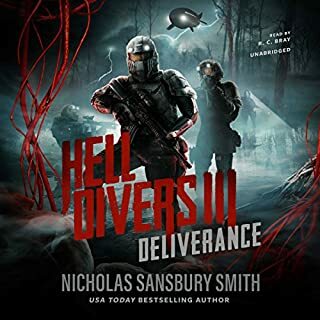 The beginning of the book seemed to start out pretty fast and hard and it quickly ramped up further and I soon found myself emotionally invested in the characters and wondering what was going to happen next. Towards the end there turned out to be a lot of build up for the future which for the sequal which I can not wait for! One downside I would give this book is although it was set up for a sequal or possibly a series in the future quite well it felt like there should have been a bit more to close off the first book, though, I do understand some people prefer it that way, it seemed a little abrubt for me. Firstly, let me just say I really enjoyed this book. In the beginning I thought it was a bit slow but the characters were well done and I personally thought the ending was great. There were a couple of plot twists and some people will see them and some won’t. Overall, this was a great book. 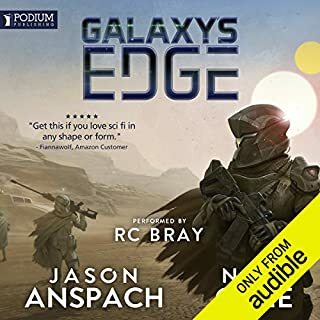 Alright, so this book as touted as ‘like the Expanse’ and I’d say this is a fair assessment. The world built by the author has a very Expanse feel in that there’s the ‘earthers’ and then the ‘ringers’, similar to the expanse having the ‘inners’ and ‘belters’ (and nearly identical animosities). I particularly found the reorganization of earth cities into long metropolitan strings to be very unique and also made a lot of sense for a potential society. 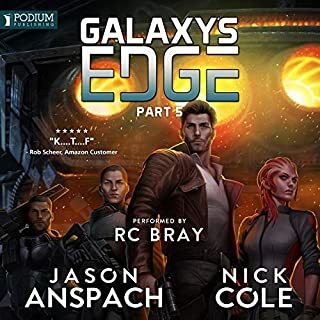 The protagonist himself is sorta similar to the Expanse’s Miller - he’s akin to a bounty hunter who has made a lot of mistakes in life, drinks to much and only really lives for the job. The book flashes back to how he got this way and while Malcom (protagonist) lives a less than stellar life, you do end up caring for him. Without getting to much more into it, the supporting characters are also themselves unique and well written. The book itself is part of a series but the second one is about a different set of characters (according to the description) and the way this book ended, a reader could realistically read only this book and feel they had completed a story if the thought of beginning another series is a bit daunting. Overall, again - highly recommend the book for anyone looking for a shorter mystery sci-fi. And as always, R.C. Bray provided a fantastic narration with consistent characters and an ever present enthusiasm for the story. I feel like I will either undersell this book, or give away all the good parts. I decided on underselling. Though on first appearances this looks to be a sci-fi, this is not a story of spaceships battling in space, but instead of a man trying to do his job. In a World/Galaxy where companies have at least as much or as the government, their internal security are somewhere between police and military, with morality at times a bit ambivalent. But this is not a morality story about business and government, but about the impact on someone living such a life. What would that do to someone and how would it shape the way they see the world and the decisions they make? But the end I was more emotionally invested than I usually get in characters I read about, and I feel I learned more about myself as a reader for reading it than I have in a while. 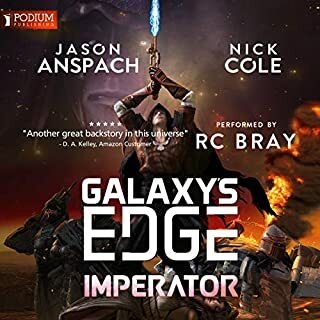 R.C Bray does it again with amazing narration of another great SciFi. excited for the next! This was an enjoyable listen - on par with previous works I've enjoyed by Rhett C Bruno (e.g. The Circuit). 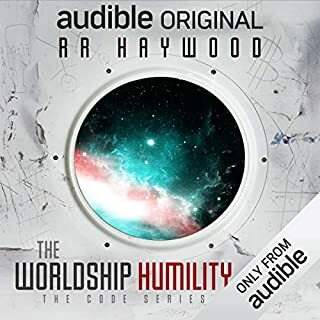 If you've read/listened to the previous incarnation of the book/series ("Titan's Wrath" - no longer available) this is still worth your time, especially with the superb narration by RC Bray. Who do you send where law don't even feel safe? 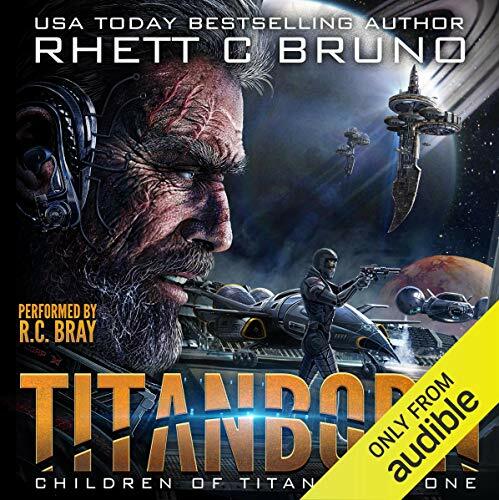 If you are a fan of science fiction bounty hunter type stories in the likes of “The Roak” series by Jake Bible or “The Coilhunter” series by Dean Wilson, you will find the first book in the “Children of Titan” series called “Titanborn” to be a welcomed listen. 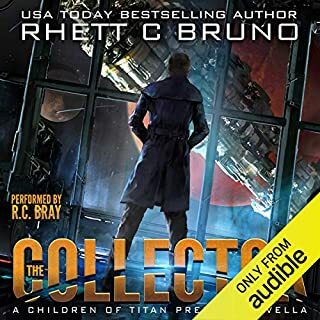 The book is very well written by Rhett C. Bruno and the audiobook narration is skillfully performed by one of my favorites; R. C. Bray. This book is the first I have listened to, written by Mr. Bruno, and I do not think it will be my last. 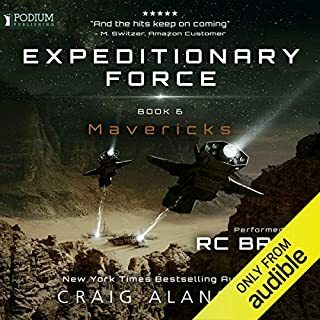 If you are a fan of science fiction, action, adventure, suspense, along with quite a few twists and turns, I recommend you pick up this audiobook and give it a listen. The story felt more like I was watching a movie unfolding than listening to an audiobook. Even though the book was detailed and complex, the author did a good job of leaving out some of the more extraneous information that can clog up a work. The book felt tight and on point having multidimensional characters and well-crafted scenes and technology. Instead of evolving into a better society for our future, in this book we see that all of the populated parts of the solar system have degraded into a gritty and grimy place where you either conform, corrupt, or collide with the law; often run by companies. Yet, we see that even in this story, there are places where not even the law feels safe treading, so that is when you send in a bounty hunter. There is a fair amount of drinking to help make the hurt go away, some strong vulgar language, and even the ever-present profession of prostitution. Those who are successful or at least surviving are the ones who provide these key necessities to the population. After the Armageddon event, one of the core corporations (Pervenio) provided the means for the population to work and earn a living by mining resources off world. What seems like a rather mundane job, turns into a live and death battle. Add in some earlier family troubles and you have a good idea of what you will hear while listening to this book. What would I have liked to have seen more of? I am a person who enjoys tech and the actual events that occur during space travel. 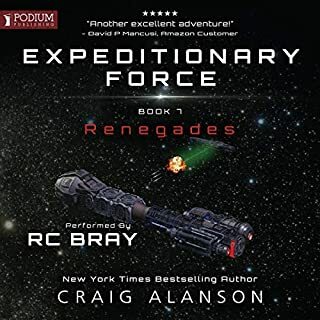 I felt the author focused more on the procedural chase and left out more of the detailed aspects around space travel itself. We often are transferred in a flash from one planet to another with only slight information on the perpetration necessary for both departure and landing including the impact such travel often has upon the human body. Some of the details provided around the space suits were welcomed along with the differences in gravity while on the various planets. I simply would have liked more scientific data and research backing up the story. Knowing it is a piece of fiction, I can suspend belief in a few areas and the tale is still quite engaging and entertaining. 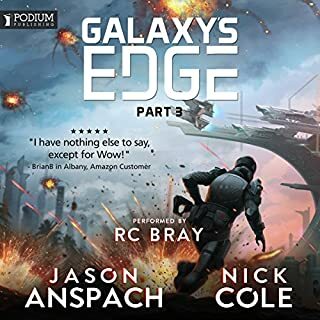 I have been a fan of R. C. Bray’s narration for years now, and I was excited to see him performing this new science fiction series. He has a smooth yet gritty voice that does the main character justice in this book. He is also a skilled narrator who is able to give each character their own unique characteristics and personality. Although Jaf was often an annoying sidekick, in my opinion, Mr. Bray did an exceptional job of giving him life and feeling that matched his character. I very much like when a narrator is able to complement the story instead of distracting from it. The audio itself was clean and clear of any noticeable artifacts such as page turns, swallows, etc. As well, the book’s volume and pacing were consistent. 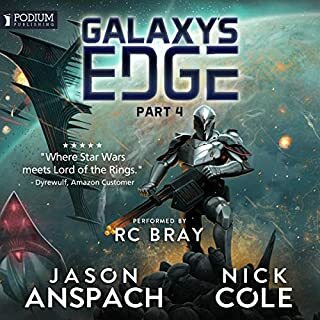 If you are ever looking for a solid narrator, I suggest you listen to a few of the performances by Bray. For parents or younger readers, I would say this book is more geared toward a mature audience. As stated previously, there is alcohol and drug use, sexual themes, and some heavy vulgar language. Nothing was excessive compared to other works in the genre but be aware they are here in this book as well. I understand when an author attempts to construct a specific type of world and these items are often to get a point across. If you are easily offended by any of the above, I would recommend you locate a different series. In summary, Titanborn looks like it is off to a good start as a new science fiction bounty hunter series. Although most of the story’s plot lines were closed when the last chapter was heard, there are a number of remaining questions leaving the way for the next in the series. 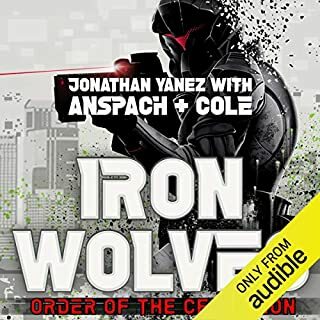 If you like your science fiction to be gritty and, in some ways, dark (think Blade Runner), I think you are going to enjoy this book and the ones to come. Fast paced and keeps your interest. I’m looking forward to the rest of the series. Reminds me of the Red Rising trilogy. 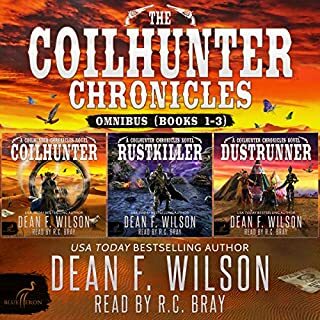 RC Bray, as always, does well bringing the story & characters to life. The story is set in a time of big corporations and politics between spacers and grounders (to use old school terms). The primary character is perhaps a little Deckard-like, in a similar role. Nevertheless the story has some twists, things tie together nicely, and it has a decent ending. It just felt a little short. 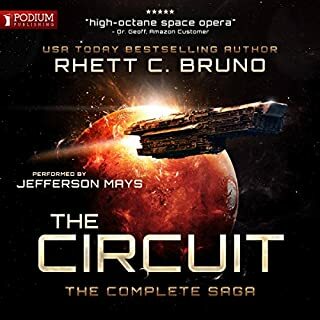 Rhett Bruno has done well creating a story that, like his other book The Circuit is set in the far future in our own solar system. The story is well paced and kept me entertained all the way through. The Corporations are the new governments and our protagonist, Malcolm Graves, is a Collector. Part Cop and Bounty Hunter. 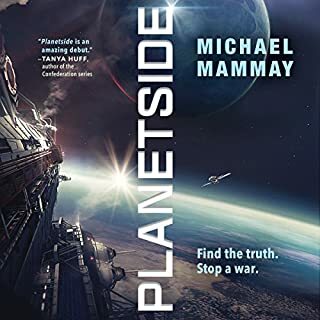 I think the story flowed well with a few interesting twists and turns that take us over many locations in the solar system. The cliff hanger ending left me wanting more and I look forward to the next installment. The main synopsis is that Earth was hit by a meteorite and the planet was changed forever. A few hundred years later and a world government was established, but a few major corporations seem to have the real Power. The main character Malcolm, works for one of them and is sent on a mission to find out who was behind an attack on Earth. The book is short and a fast read, but the world building was great. Rhett was able to get a lot of detail out in a short amount of time and made it enjoyable. It reminds me a little of Expanse with the belters and worlds fighting with one another. The relationship between Malcolm and his new partner reminds me of a TV show called, Almost Human. They had serious, but funny interactions with one another. I enjoyed the book, but the ending was very surprising and wasn't expecting it. I think Malcolm could have handled it differently. I look forward to the next book to see what happens. The audio was great, there aren't unique voices for each character but RC is able to put a slight distinction in each character. I was given this free review copy audiobook at my request and have voluntarily left this review.